Book Passage contributing blogger Zack Ruskin interviewed author Sarah Vowell about her new book Unfamiliar Fishes ($25.95). 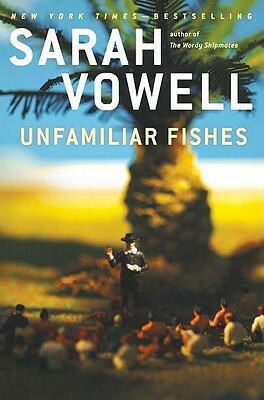 Vowell will be appearing at Book Passage in Corte Madera on Friday, April 1, 2011 at 1:00 pm. Zack Ruskin: Your last couple of books have focused on some rather eccentric characters from history, like John Winthrop in The Wordy Shipmates and Queen Lili'uokalani in Unfamiliar Fishes. Do you find there is a correlation between these people and figures in modern politics today? Sarah Vowell: Winthrop, the first governor of the Massachusetts Bay Colony, and the last queen of the Kingdom of Hawaii share a way with words. In fact, one could argue that their contributions to literature outshine their political achievements--Winthrop for his sermon "A Modell of Christian Charity" and the queen for her song "Aloha 'Oe" and her memoir Hawaii's Story by Hawaii's Queen, written to argue against American annexation of the islands. I suppose President Obama could be lumped into the category of writer-politicians. ZR: In many of your books, there's a strong undercurrent of religion propelling the events you depict. Why do you think it is that so many major (and minor) chapters of history have been written in the ink of faith? SV: It's a mistake to underestimate the burning flames of hell as a motivator. ZR: Do you prefer writing the portions of your book where you're describing history or the more memoir-focused, anecdotal passages? Is one much tougher to write than the other? SV: It's all hard. I'm happiest when I'm connecting dots. For example, when I was writing about the founding of Boston I had to figure out how that Protestant bastion became the Catholic capital of America. I've never been more giddy than the moment I realized that both developments had to do with microbes--that the Puritans could settle Massachusetts so quickly and peacefully because a plague wiled out most of the native population just before their arrival, and that a potato blight in Ireland a couple of centuries later sent droves of Irish Catholics to Boston Harbor. ZR: Nerd confession: I absolutely adore the covers of all of your books. Whose idea was it to pose little figurines themed to your work, and why didn't I think of it? SV: David Levinthal, a photographer who lives in my neighborhood, shoots the covers. My editor heard there was an artist making Polaroids of Abraham Lincoln using vintage toys. That's how we found him. I think his work speaks to mine in that the toys have an inherently playful quality but the lighting is nevertheless a little melancholy and ominous. ZR: There seems to be a trend occurring where authors writing nonfiction (you, Mary Roach, Bill Bryson) have sprinkled humor into their narratives. What do you see as the value in bringing the funny with the facts? SV: Seems like there is inherent value in not being a total drag. That and history is so crushing, so dispiriting, that without a dry sense of humor, I would never stop weeping. I think I'm drawn to writing about people who believe they are right. Because I am full of doubt and also sort of low-key, I'm endlessly amused by historical figures like religious fanatics or assassins, because to me, there is nothing funnier than self-important blowhards. ZR: Now that you’ve finished your book, what's the process for paring down the infinite pool of potential subjects for your next work into something concrete, like the U.S.'s annexation of Hawaii? Are you actively seeking your next project, or do they tend to find you? SV: I'm always on the lookout. But so far I have no idea what's next. Which is a source of no small amount of anxiety, so thanks for reminding me. ZR: If you could be asked by any living person to do their official biography, who would you pick? SV: I would never do that. I try and avoid the living.